Back in 2011, moviegoers were introduced to Sonny (Dev Patel), the relentlessly optimistic Indian man with his heart set on making The Best Exotic Marigold Hotel the ultimate retirement community, and an unlikely group of British retirees who wind up as his customers. The obstacles were formidable, but of course Sonny and the retirees were able to make everything work, and the film ended with them happily settling into the city of Jaipur, India. Now we are presented with “The Second Best Exotic Marigold Hotel,” a sequel in which Sonny is determined to open a second hotel (since the first has only one remaining vacancy and is wildly successful). In many ways it’s more of the same, like any sequel, but it takes on the continuation of the retirees’ storylines from the first film and gives us a look at what comes after the standard happy ending. Sonny is trying to juggle his impending marriage to Sunaina (Tina Desai) and his attempts to get funding to purchase a second building to expand his business. An undercover inspector is to be sent by one of the possible investment firms, to give him one more thing to worry about. Meanwhile, Evelyn (Judi Dench) and Douglas (Bill Nighy) are in a not-quite-relationship and exploring being part of the Jaipur workforce – Evelyn as a fabric supplier and Douglas as a tour guide (with a crafty workaround for his inability to memorize new information). Mrs. Donnelly (Maggie Smith) is just as crotchety and competent in the first film, giving Sonny acerbic advice about business and generally being delightfully irritable. Norman (Ronald Pickup), who’s trying out monogamy with Carol (Diana Hardcastle), accidentally hires a tuk-tuk driver to bump her off. Madge (Celia Imrie) is wildly popular on the dating scene, and juggling two serious suitors. There’s a serious undercurrent to the film, as with the first one – none of the seniors know how much longer they have, and they all react to that a little differently. Sonny’s daily roll call to make sure nobody has died overnight is a daily reminder of mortality. Mostly, though, it’s a comedy of misunderstandings, strong personalities, and a determination to look difficulty in the face and be sure that everything will work out for the best. An ongoing subplot in which an old friend (Shazad Latif) returns to town and inflames Sonny’s insecurities gives us a glimpse behind the young man’s optimistic façade. Whether you’ll like the film probably depends largely on whether you liked the first. 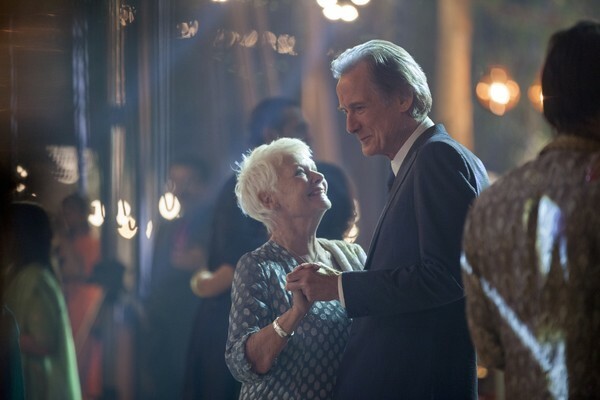 “The Second Best Exotic Marigold Hotel” can certainly be seen without having watched its predecessor, but there’s much more to appreciate with the earlier film in your memory. Both movies are charming and funny, and walk the line between demonizing and romanticizing love, old age, insecurity, and India itself.